WELCOME to the 22nd issue of BYMRr-Zine - a newsletter published by Building Your Model Railroad, and devoted to providing breaking news and tips to model railroaders of all ages and all scales in a quick and easy-to-read format. Resources are always credited where appropriate. 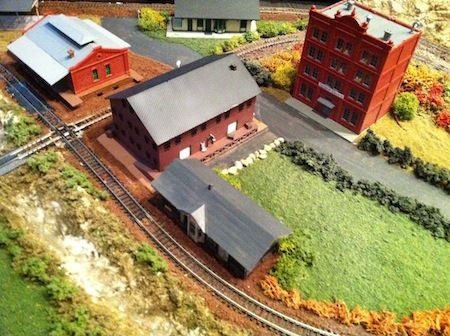 Kato tracks are a great way to get started in model railroading. The tracks fit together flawlessly, which really reduces the risk of derailments. They can be purchased as individual pieces, and they also come in a variety of kits that can be combined to form any type of track plan that you want - from a simple oval up to a complicated double-twisted dog-bone, or anything in between, including viaducts, bridges and stations. You can get your trains up and running very quickly after laying the tracks. The scenery and details can be added at your leisure later, but at least you have trains running without a lot of hassle. They also sell DC transformers and built-up structures that can help reduce the startup time. Wiring is as easy as "plug-and-play", even for turnouts. As you get more sophisticated, you can always change to DCC later. And you can make it as large as you want by adding on more sections as time goes on. The following is a picture of a a small layout assembled with Kato tracks in fairly short order - mostly in one evening for the tracks and wiring. The structures took a while to build. About half of them shown here are kits that had to be assembled and painted and half are built-ups from Woodland Scenics. Many more details need to be added of course, like bushes, trees, roads, terrain modification, cars, people, etc. But it was fun getting everything up and running quickly. If you don't have the time or the patience for a layout that takes several years to create, this is for you! Here is another small layout that I've shown in a previous issue of this newsletter, shown here again for comparison . This took longer to make than the one shown above because it involves gluing down roadbed and laying multiple track sections mixed with flex track. Several of the joints required soldering and there is some troubleshooting involved in making sure the tracks are lined up well enough to avoid derailments. The wiring is a little tricky as well because the inner figure eight is actually a reverse loop, so rail-gaps have to be used to isolate the inner from the outer track. It's currently wired for DC, but it would be easy to switch to DCC, and in fact operation would be smoother with DCC since most DCC transformers have an automatic reverse feature included with the transformer. Again many details will have to be added to complete this layout, but it is at the point where trains can run and operating sessions can occur. The initial startup of this layout took me about a month of working several evenings a week to finish. Adding the additional details to "finish" it can be done gradually at your leisure. There are lots of automated wiring options that could be done on a layout like this using circuit boards to start and stop trains at certain point all by themselves. Imagine a layout where you can just throw a switch and watch the trains do their thing automatically! I'm not very organized sometimes when it comes to tools, paint supplies, and myriads of other stuff that we need ready access to when we're involved in a model railroading project. At the end of a "work" session, I frequently just leave the tools laying on the bench or wherever I was using them. As a result, I spend a lot of my time just looking for stuff - certainly not a very efficient way of getting anything done. So, I read the article "Organization and Storage", by Bob Walker in the October, 2012 issue of Railroad Model Craftsman with great interest. I ultimately resolved to better organize my working area so that the work would go faster and be even more enjoyable. I thought this would be a great tip for all of us so I included it here. The picture in the article shows shallow shelves from ceiling to floor that are just wide enough to hold small bottles of paint and multiple holders for small hobby tools. Also there were rows of labelled small file boxes containing an assortment of all kinds of small parts - "a place for everything and everything in its place". This is really important, especially for our hobby where there are so many little tools, parts and bottles of things that are easy to lose. I'm converted! From now on, everything goes back to its proper place at the end of the work session! Several books, DVDs and numerous articles on how to build model railroad scenery have been written and/or created by Paul Scoles. His expertise is readily evident in the pictures printed in those materials. There is now a new book by him called simply Building Scenery which promises to be another excellent source of tips and techniques that can help us produce fantastic scenery for our model railroads. It's available for order at www.carstensbookstore.com. Locomotive and rolling stock wheel cleaning just got a whole lot easier with Woodland Scenic's Tidy Track Roto Wheel Cleaner System as reviewed by Joe Casper recently in Model Railroad News. (November, 2012, p58). There's one for HO and one for N scale that can accommodate multiple axles at once. The only problem is that the N scale version isn't long enough to handle cars more than 62 scale feet long. Otherwise, It works great! I really like visiting old railroad depots, train museums and restored railroads even if they are a little "touristy" sometimes. But, when I go I always learn some fascinating history and usually get to climb aboard a locomotive or railcar or maybe even take a short train ride. Many of these rides are fantastic little journeys into some of the most beautiful landscapes in the world. 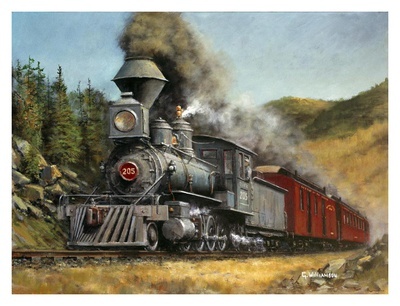 I previously rode on the Georgetown Loop in Colorado on a steam train which was a real thrill, going over lots of bridges and tortuous terrain that would be awesome to model. I've also ridden on the Cass railroad in West Virginia, which was a great close-up demonstration of how logging railroads used switch-backs to climb steep mountains, not to mention the beauty of the autumn vistas that we took in while we were there. 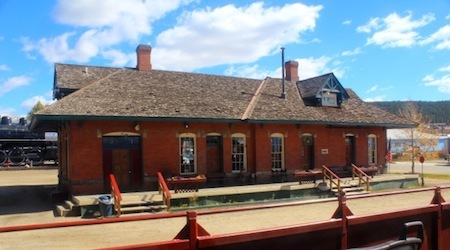 Most recently, while in Colorado, I had the great opportunity to visit the restored depot in Leadville and ride the Leadville, Colorado and Southern Railroad, formerly the Denver, South Park and Pacific Railroad (DSP&P), affectionately known back in the late 1800's as the "South Park", also known as the "Seldom Punctual". The South Park was painstakingly built over 10 years (1874-1884) at an elevation of 10-11,000 feet during the Gold Rush over rough regional terrain to haul tons of gold, silver, coal, lumber and molybdenum out of the mountains, not to mention transporting food, supplies and passengers back and forth. 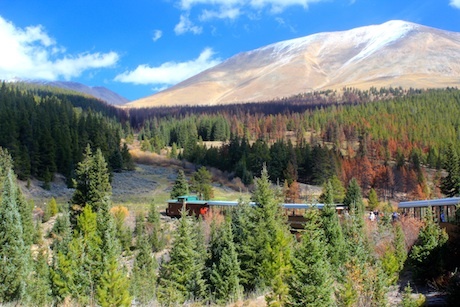 The last run was in 1986 carrying Molybdenum from the Climax Mine to Leadville. The views from one of the open cars on this ride were nothing less than spectacular, especially in the fall when the aspen trees were bright gold and shimmery in the October sun. The leaves even looked like gold coins. I took lots of pictures as the guide told about the history. Whenever you get the chance, I would heartily recommend visiting one of these railroads. It makes for a very enjoyable family event, a wonderful learning experience and even better, it can give you great ideas for your model railroad layout at home! ~ Attach mountain climbers to your mountains or cliffs. ~ Use "gravel" (sand and small pebbles) in a steep depression along a mountainside to form a landslide. Put a sign up along the tracks or road below saying "Danger! Falling Rocks". ~ Use stone or granite textured spray paints to make stone walkways, road, retaining walls or even as a base paint before laying track. Once I used a green textured paint to simulate grass over a large area. Then used a thin layer of ground foam for even more texture and variability. ~ Next time you build a house from a kit, leave off one wall and the room. Then glue in a wood frame for the one missing wall and for the roof. Put construction workers, trucks and cement mixer all around the area to complete the look of a work in progress. ~ Use thin fishing line for telephone power lines, cable lines and wire fences. Paint them silver of black if necessary. ~ Use an old mesh garment cut up in small rectangular sections and stretch them between metal posts to make a chain link fence or to make a backdrop fence for a baseball park. Paint it silver or rust. ~ If you want to hide those unsightly Atlas turnout switches that sit on top of your layout, make a small loading dock for each one using small scale wood planks and 2x4's that you can buy from hobby shops. Or glue a lot of bushes on top of each switch - just be sure not to get any glue in the mechanism. 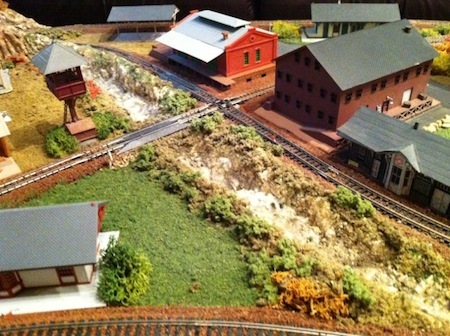 ~ If your layout is powered by DCC, make a programming track that is separate from the rest of the track by putting a readily accessible line of trackage incorporated into your scenery such that both ends of the track end up in bushes or scenery that goes nowhere but looks like it goes somewhere. Or it could look like an old abandoned track that is no longer connected to the mainline. Or it could be attached to the mainline as a spur but with railgaps on both rails at the connection to be sure it is isolated from the main operating track.